Chances are, that if you are ever questioned by the police about a crime, you will be eager to tell them everything you know. And, if it turns out that you are a suspect, you will want to waive your rights to remain silent and to have an attorney present, and will want to explain to the police the reasons you couldn’t have the crime. That is a serious mistake according to James Duane, author of the book, “You Have the Right to Remain Innocent” and the YouTube video “Don’t Talk to the Police“. In his book and video, Duane contends that you should never talk to the police or give out any unnecessary information unless you have an attorney present, especially if you are innocent. The problem is that while you know that you are innocent, the police do not. They think that you are guilty or they wouldn’t be interested in talking to you. Because the friendly police officer who is asking questions just to clear things up is certain, in his mind, that you are guilty, he feels justified, and is legally empowered to, use any means of deception or pressure to get you to confess to the crime. This means that any discrepancies in your answers (who really can keep every detail of what they did last Thursday evening straight in their minds, especially when questioned by a trained interrogator seeking to trip them up? ), any misstatements, any statement taken out of context can be taken as proof of guilt and used against you in court. Remember that scene in My Cousin Vinny in which Ralph Macchio repeats the statement, “I shot the clerk” incredulously only to have it repeated as a straightforward statement of guilt at his trial. This sort of thing really happens. Compounding the problem are recent court decisions which, according to Duane, make more difficult for a suspect to use their rights to remain silent and seek counsel. It is far easier for the police to get away with lying to you to induce a confession and they can ignore a request to speak to an attorney, unless you clearly and explicitly ask for one. Taking the fifth to avoid incrimination can be a perilous step, since such a request can not be used to imply guilt. Making matters worse is the problem of overcriminalization. As Duane points out, there are so many federal laws on the books and so many of them are badly and carelessly worded by Congress, that it is no longer possible for any human being to know the whole scope of the laws, much less be in compliance. Any given individual may be guilty of committing many federal offenses on any given day. A clever and unscrupulous prosecutor can find something to convict anyone. Speaking too freely could get you in trouble. It is not necessary to buy and read this book if you can remember to say only four words when questioned by the police; “I want a lawyer”. 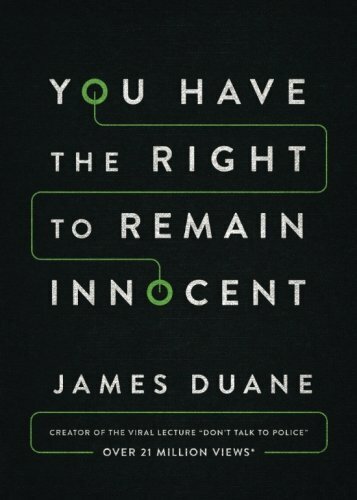 But You Have a Right to Remain Innocent is worth reading if you want to get some idea of just how poorly our system of justice protects the rights of the accused. Prepare to be shocked and alarmed.